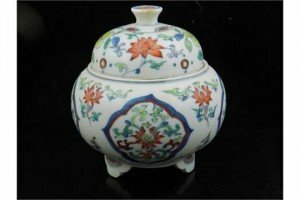 A Chinese porcelain doucai pot and cover, of ovoid form, decorated with flowers and foliage, raised on three shaped feet, bears six character mark to base. 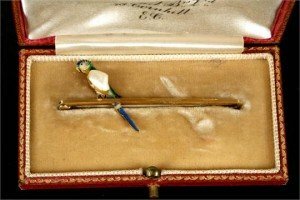 A vintage 15ct gold, enamel and pearl set parrot bar brooch, contained in its original fitted box. 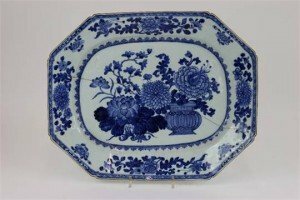 A Chinese export porcelain meat plate, probably Jiaqing, angular form with canted corners, decorated with flowers and foliage. 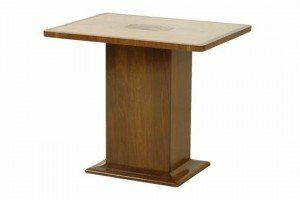 An Art Deco walnut and maple inlaid side table, the centre with a specimen wood panel, on a rectangular stand and plinth. 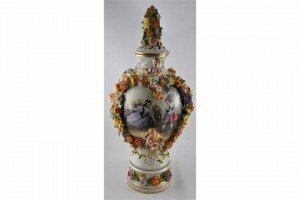 A large Dresden style vase, the baluster body moulded with cherubs, fruit and floral swags. 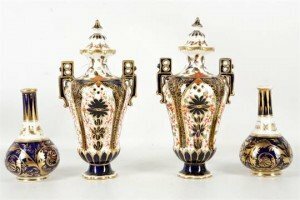 A pair of early 19th Century crown Derby blue and gilded porcelain vases, and a pair of Imari and gilded twin handled porcelain jugs with covers. 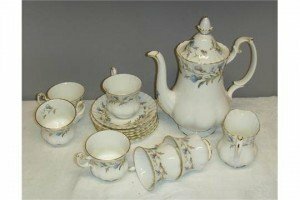 A Royal Albert Bone China tea service in the Brigadoon pattern, comprising; tea pot, six cups and saucers, milk jug and cream jug. 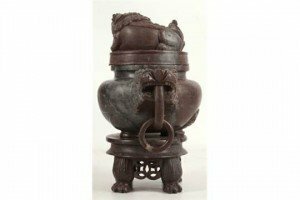 A Chinese stoneware carved incense burner, dog of Fo finial with temple ball, twin mask and ring handles, raised on four paw feet. 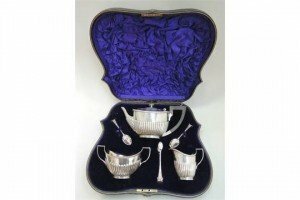 A cased silver bachelors tea set comprising tea pot, creamer and sucre, having gadrooned decoration and reeded handles, teaspoons and sugar nips having foliate moulded decoration. 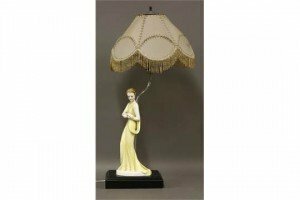 An Art Deco pottery table lamp, modelled as a lady in a yellow dress, on an ebonized plinth, with a multi plate shade. 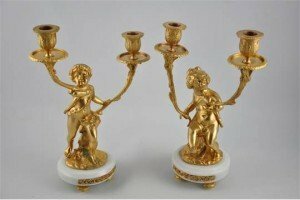 A pair of Louis XVI design ormolu candlesticks modelled as cherubs holding vineous cast branches. 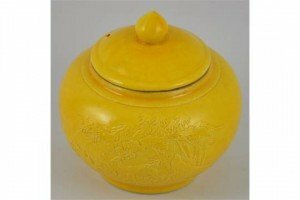 A small Chinese ginger jar with a yellow glaze and a finial on the lid, bears six character Qianling style mark to base. 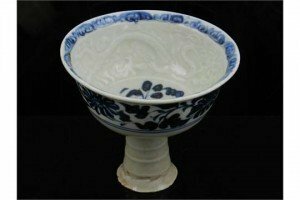 A Chinese blue and white porcelain stem cup, the interior relief decorated with dragons chasing flaming pearls, the exterior with flowers and foliage. 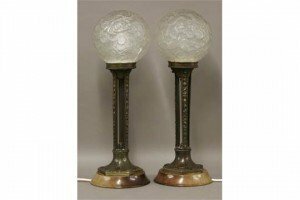 A pair of Art Deco style bronze table lamps, with frosted glass globes moulded with butterflies and flowers, on turned wooden bases. 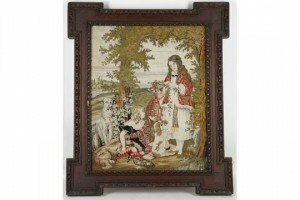 A 19th Century tapestry, decorated with castles, gardens and a Scottish boy, dog with English rose and girl with dogs. Contained in a carved oak frame. 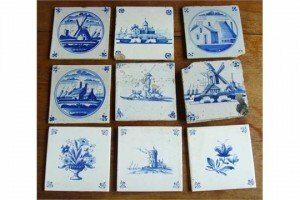 A group of nine 18th century and later blue and white Delft tiles depicting various scenes including traditional buildings and figures. 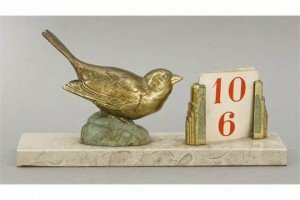 A gilt metal desk calendar, mounted with a bird beside a calendar mount, on a marble plinth. 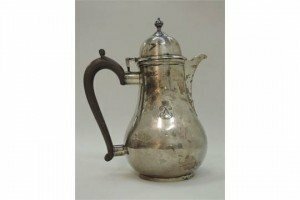 A silver coffee pot of plain baluster form having fruit wood handle, dome lid with finial and circular foot, London 1904. 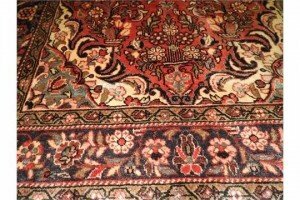 A fine north west Persian Lillihan rug, the central floral medallion with repeating petal motifs on a terracotta field within stylised petal motifs border. 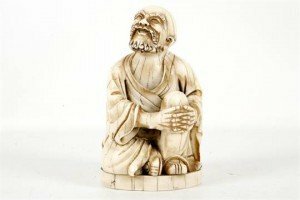 A far Eastern figure of a seated man who is smiling and has a bald head and beard, signed with device on the base.